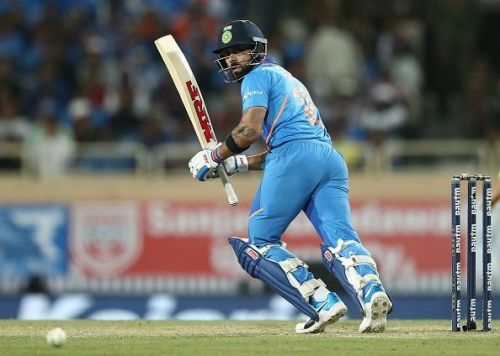 In an interesting article that I came across after India’s captain Virat Kohli launched his 41st ODI hundred in the 3rd ODI against Australia at Ranchi, the writer begged to his or her readers to find a new adjective to describe King Kohli and why won’t I too? Technically, we appear to have used up all the adjectives and figures of speech in the dictionary to appreciate, admire, honour and understand Virat’s colossal achievements over the years. Yes, India lost the match, but the Indian skipper waged a lone battle to find himself on the wrong side of the result at least on this occasion though. On this note, I started to contemplate what can we learn from Virat Kohli, the batsman and the skipper that can be relatable to our everyday lives and to what we can connect ourselves. Success was never easy and never will be and whoever desires to be successful, should be willing to pay a price. It all depends upon how badly you want it and the price that you pay is called self-discipline or work ethic. I guess the biggest factor in Virat Kohli’s success is the way he exercises extreme self-discipline through his rigorous work ethic. The time when he joined the senior Indian team, he seemed to be like a spoiled brat who never had any control over his emotions or aggression. But, especially after 2011 World Cup, inspired by his will to succeed under any circumstances, he channelized his aggression through intense work ethic and disciplined mindset to transform into a giant of a player that he eventually became. Not only that, when he understood that he lacked core strength and at times physical prowess to pull off sixes at will, especially when his team needed them the most and to minimalize the fatigue factor during a long grueling innings, Kohli added core-building exercises and strict diet patterns so as to give himself a necessary push. Following a rigorous work ethic and maintaining self-discipline day in and day out sounds extremely difficult to implement but the rewards one can reap out of this are extremely fruitful and hence self-discipline becomes an integral part which we can adapt into our lives from Kohli's book to make ourselves more successful. Passion these days seems to be like a fancy word and if you genuinely want to understand what passion really is, there are very few sportspersons in the world today as passionate as Virat Kohli. To come out to bat in spite of knowing about his father’s death and scoring a match-saving 90 for his state team Delhi against Karnataka in Ranji Trophy, thereby delaying his father’s funeral, speaks volumes not only about his passion towards the game but also about his unconquerable level of dedication and determination. They say if you are passionate about something, nothing is impossible, you will always find a way in spite of coming across a lot of hardships and this stands out clearly as far as Virat Kohli is concerned. But just having passion is not enough, isn’t it? When passion meets will power, things that are unheard of happen and this has been the story throughout Kohli’s career. His unadulterated will-power is on exhibition, particularly during run chases and his successful record in run-chases is a further testimony to the saying ‘where there is a will, there is a way’. As a common man, Virat Kohli’s success story that revolves around passion and tremendous will-power is an inspiration in itself and certainly can be incorporated in our lives to create a better version of ourselves. When we come across a switch in general, it is either on or off. But, Virat Kohli is like a switch which is always on. Have you ever seen him rusty or lost or less animated? No we haven’t. Be it his batting or his captaincy, he is always there, in the midst of everything, soaking in all the minute details like an ideal student of the game, always trying to improve as a player by each passing delivery. Just on the sheer comparison of the amount of the intensity he associates with each and every ball, Kohli resembles to Rafael Nadal of tennis who is as pumped up and animated on courts as Kohli is. Moreover, Kohli plays all the three formats of the game equally well and is not only the skipper of the Indian side but also captains his franchise team Royal Challengers Bangalore in the IPL and with the ever so busy cricketing calendar we have, one can understand the toll Kohli should be going through physically but more so mentally. Considering all this, it is indeed incredible to witness Kohli always maintaining so much high intensity when he is on-field and something definitely worth learning from. Just imagine if we can maintain such a high intensity in our lives as Kohli does even though if it can only be in short-bursts just as fast bowlers bowl their spells in short bursts, how amazing would that be? Indeed, worth giving it a try, if not anything else. Till not far back, Virat Kohli would run into wild celebrations on completing his centuries or fight head on with his oppositions not with the bat but with his mouth in the middle. Or even at times, especially like he did Down Under in 2012, get on a banter against the crowd. All these displays of unnecessary and unwanted aggression definitely do not go down well with the etiquette and manners of the gentlemen’s game which I totally agree with. However, I have slightly different perspective as well. What if this kind of ego, attitude and big mouth is actually working in favour of a particular player just as it did in the case of great Kevin Pietersen too? I strongly believe that Kohli’s at times outrageous attitude and outspoken mouth actually motivate him to go for that little extra which in turn helps him to bring the best out of himself. His animated displays of joys or disappointments are actually an indication of how much stoked or involved he is in the game and if these things are actually working in favour of a player, why brag him about being indecent? Just as long as these acts are not disrespectful towards the opposition or crowd, it is not always bad to have a healthy amount of ego and attitude which actually can make a person self-confident and will make sure that their opponent doesn’t take them lightly either. This trait of Virat Kohli, even though a bit controversial at times, can be implemented in our lives on an individual level if it can work for any given person. To achieve those things we haven’t achieved, we must first do those things that we haven’t done. And while we try to maneuver our ways though these uncharted territories, we may come across situations where we will need to wage a lone battle. And how often have we witnessed King Kohli standing tall among the fallen pins just as his predecessor Sachin Tendulkar would do? There’s a tricky story while you battle alone, not only do you stop receiving support of others but also you start losing your self-belief on achieving something as you see your mates falling around you. It is alarmingly incredible to note how many times has Kohli made a team-game look like a one-man show at least as far as batting is concerned and in the process has carried the burden of India’s batting single-handedly on his shoulders. Fighting a lone battle was never fun and in fact is a long, grueling and frustrating state where thoughts like why should I always do the dirty work can easily creep into one’s mind. This can be easily be relatable to people in the corporate set up who always work overtime just to make sure the ends meet. But, only champion people like Kohli would know the satisfaction of achieving something that was thought as unthinkable or impossible by their mates and in the process left them alone, leaving them with no choice, but to battle all by themselves. Kohli’s ability to wage a lone battle is a life-lesson for all of those who have fear of fighting alone and his mammoth achievements simply are a proof of the fact that it is always the darkest before the dawn and the ones who have the courage to fight through this dark will be blessed by a glorious sunshine that lies ahead. Indeed, Virat Kohli’s presence on a cricket ground and especially on that 22-yard strip is like an inspiration not only to budding and existing cricketers but also to each and every person who is willing to make it big. Incorporating a few of his traits into our routine and personality can surely help us transform our life into something more meaningful, satisfying and successful.